If Microsoft were to have a motto for Office 2016, it could well be the old coaching adage “There is no ‘I’ in “team.” The suite offers considerable collaborative and teamwork features that turn Office from a tool for a single person into one that helps people work together. 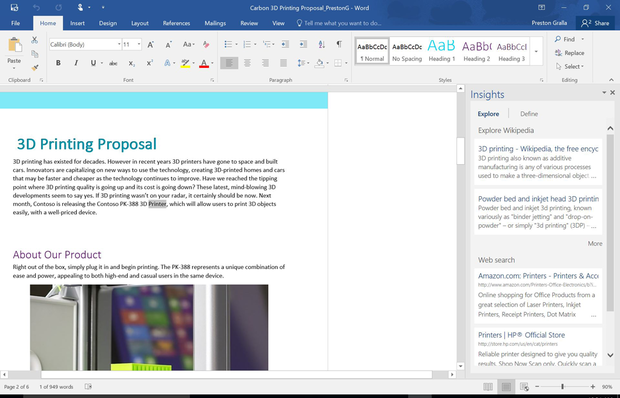 If you work by yourself and will use Office as a standalone product, you’ll find far fewer changes from Office 2013. That’s not necessarily a bad thing – Office is already so stacked with features that adding new ones just for the sake of it could harm rather than help its usability. How successful has Microsoft been in adding collaboration features? 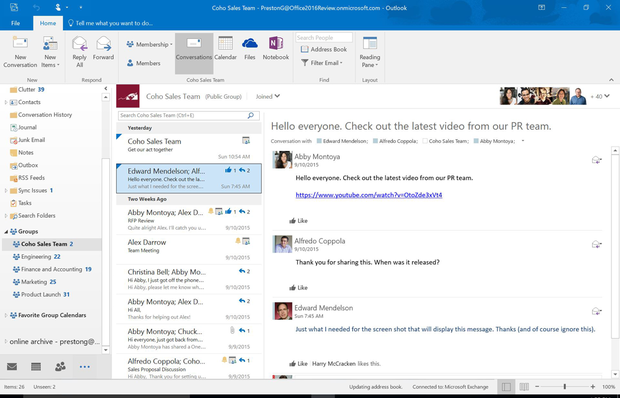 And how useful are the handful of non-collaborative features added to the core of Office? That’s what I’ll cover in the rest of this review. The Office suite, particularly Word, has long had the best features of any productivity-tool suite for letting people review each other’s documents – I’ve always thought that its change-tracking, markup and reviewing features were the gold standard for document review. As someone who makes a living as a writer, I can’t imagine doing without them. When Office 2016 was released in September 2015, real-time collaboration worked only with Word, PowerPoint and OneNote documents. In July 2017 Microsoft finally made the feature available in Excel as well — but only for Office 365 subscribers who have updated to Version 1707 Build 8326.2058 or later. (At some point Microsoft will roll out the feature to the non-subscription version of Excel, but the company isn’t saying exactly when.) This real-time collaboration works in both home and business versions of Office 2016, although business users have a few extras not found in the home versions, as I’ll explain. Command central for collaborating is a new Share pane that displays when you click the Share icon in the upper-right part of an Office document that can be shared. From here, you can send an invitation for other people to share your current document and find people with whom you’ve previously shared and worked on documents. To invite people to share a document, type their email addresses in the “Invite people” box and select either “Can edit” or “Can view” in the drop-down. If you’re on a corporate network and you’re using the business version of Office 2016, you can also click the address book icon to choose co-worker email addresses. Then click Share. The Share pane lets you share files with other people, and lists those who have rights to share the file you’re currently working on. When you’re working on a document with other people, you’ll see a colored cursor in the document where they are working on it. Each person gets their own color. You can see what they do as they do it, including deleting, editing and adding text. They see what you do as well. Down the side of the pane, you’ll see a list of people who have editing access to the document. Those who are currently in the document have a colored bar next to their icon. That bar matches the color of the cursor you’ll see as they move around in the document. A nice touch is that the person with whom you’re sharing a document doesn’t have to have Office 2016. They can collaborate with you using the free Web-based version of Office, available at office.com. Just send them a link to the shared document, and when they click on the link, it opens in the Web version of Office. And collaboration extends beyond the editing screen. Click on the icon of anyone currently working on the document and a screen pops out with the various ways you can contact them, including via Skype for Business texting, Skype for Business phone calling, a Skype for Business video session or email. That way, you can talk or text with them (or email if you don’t want to do it live) while you’re working on the document, making it much easier to collaborate. 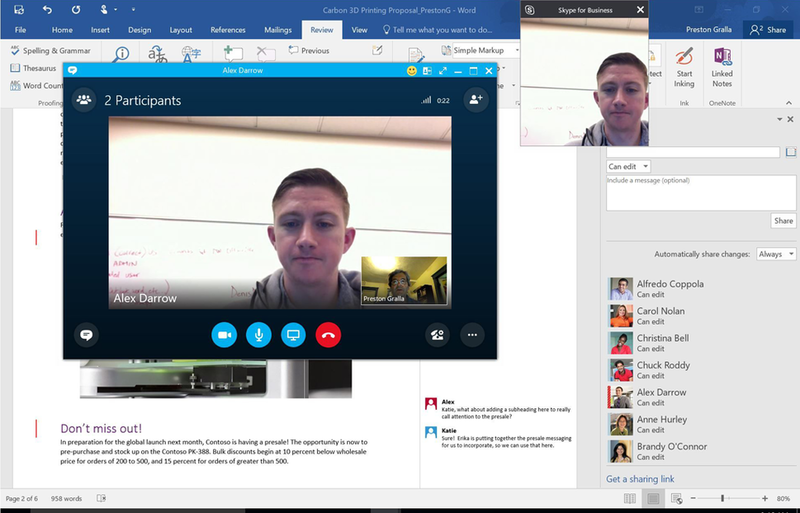 It’s easy to fire up a Skype for Business session with someone with whom you’re collaborating on a file. I found it exceptionally easy to work with others this way. That doesn’t mean, though, that I personally found it useful. When it comes to real-time collaboration on documents, I’m often a loner and a believer in the “a camel is a horse created by a committee” dictum, so I won’t use this feature much. But those who prize working with others live on documents will find it extremely useful. One thing to keep in mind is that the strength of your Internet connection will play a role in how well this feature works. In my tests, I used a laptop connected to my router via Wi-Fi and a desktop machine connected via Ethernet cable to collaborate on a document with someone across the country. Sometimes when the other person made changes, my wirelessly connected laptop didn’t show the edits right away, but my desktop did. That isn’t to fault Office, but instead to point out the sometimes flaky nature of networks. The lesson here: As with everything else related to Wi-Fi, network connections and the Internet, expect there to be glitches and lags. 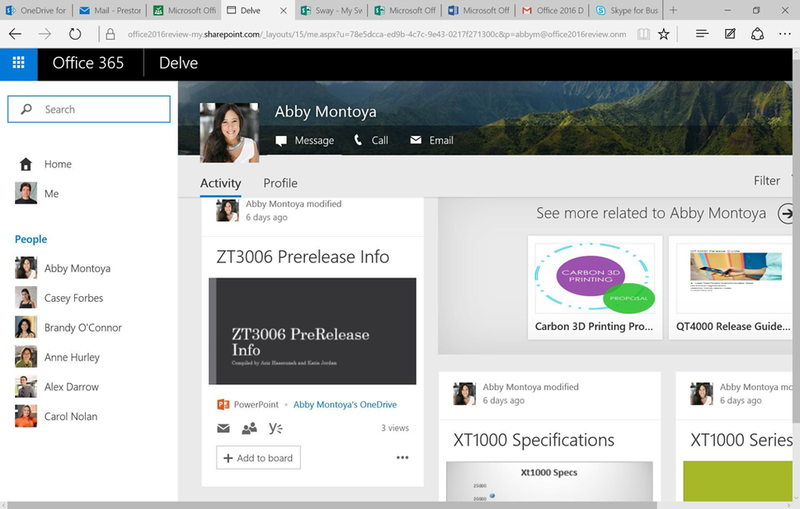 When you open Delve, the left-hand side of the screen lists the people with whom you’ve shared work, and the right-hand side shows tiles with information about the most recent Office documents you’ve shared with one another. Each tile shows a thumbnail of the document that was created, along with the name of the person who created or modified it, how long ago they created or modified it, and the type of document it is. Icons let you open the file, email the person, start a meeting with them or log into the shared folder on their OneDrive. You can also click any person in the list on the left to see that person’s profile and recent activity. This includes a list of documents they’ve worked on or shared with you, and the most recent things they’ve done to those documents. You can also check out the person’s profile, which includes an “About me” bio, the name of the person’s boss, contact information and past work projects. How useful is all this? To me it feels somewhat stalkerish. But other people might find it helpful to get more information about their co-workers and see what they’ve been up to. Office 365 Planner is a tool that, according to a Microsoft spokesperson, “will begin rolling out to Office 365 First Release customers by the end of this year.” It’s more useful than Delve, but only if you are part of a group that works in an extremely organized, project-centric way in which tasks and deliverables are closely tracked. In my experience that’s rare. However, if that’s the way you work, you’ll welcome it. It features a central Planner Hub that displays tiles that list projects in which you’re involved. Each tile displays an overview of the project – how many days left until the project is scheduled to be completed, how many tasks are left, how many have been started, how many are in progress, how many are late and how many haven’t started. Click on any project for a more detailed look at it, including to-do lists, schedules, reviews, approvals and so on. These are all separate “buckets,” as Microsoft calls them, and anyone can create a new bucket. You’ll also find charts that show the number of tasks assigned to each person, and the tasks’ current statuses. There’s also a link to your tasks, so you can see what you currently need to do, across all of your projects. 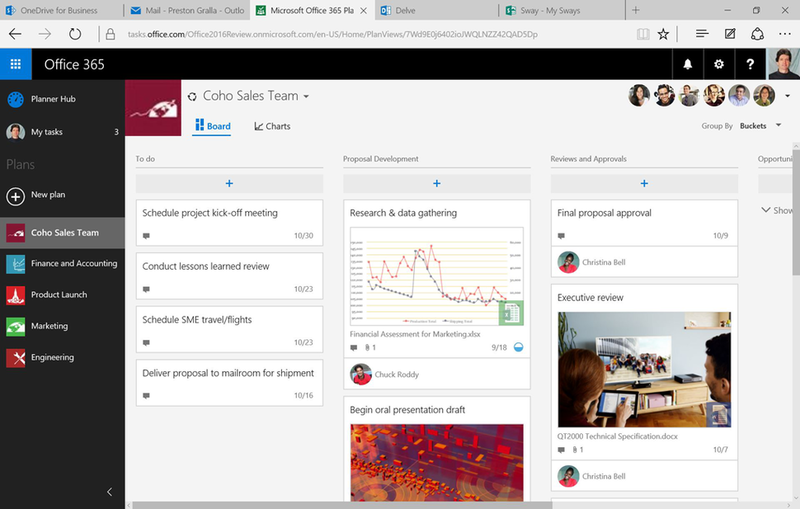 All this isn’t to say that the new features in Office are focused only on collaboration. There are also changes to a number of the core applications as well. Outlook gets the most new features, which are moderately helpful. Email’s bane is mail overload, and the new Outlook has a step to try and reduce it. It creates a “Clutter” folder where it automatically sends selected email, bypassing the Inbox folder. 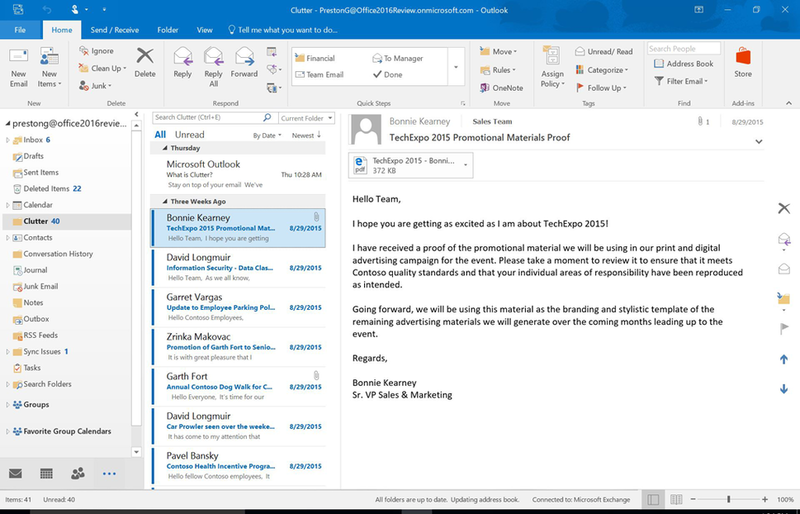 When you first run Outlook 2016, it takes a guess at what messages to put there, such as promotional or advertising-based email. Over time, though, Outlook watches how you handle your mail – which documents you open right away and which you tend to ignore, delete or open much later. It then automatically moves the type of mail you ignore or delete into Clutter, so you can check it at your leisure. You can instead focus on the important mail in your Inbox. Outlook attempts to tame email overload with a new “Clutter” folder. Especially at first, it’s a good idea to check the Clutter folder periodically to be sure no important messages have been diverted there. If they have, you can move them to your Inbox, teaching Outlook which emails you want to keep. I didn’t use Outlook for long enough to see how accurately it assessed which of my messages to assign to Clutter. However, assuming it works right, it would certainly be a productivity-enhancer. There have been a few other changes. When you compose an email and click Insert –> Attach File, you’ll see a list of all the recent files that you’ve used in Office – a great time-saver given that there’s a good chance that you’ll be attaching a file you’ve recently been working on. Business versions of Outlook also now have a Groups folder, which displays all the groups of which you’re a member. Each group has a list of all the conversation threads, meeting requests and videos in which you’ve participated. From the Home tab on Outlook’s ribbon, you can also go to the group’s calendar, OneDrive or OneNote. Outlook’s new Groups folder shows you conversations, meetings and more for the various groups you’re in. One of my favorite additions to Office 2016 is a small one that can pack a big wallop: Tell Me. It’s a text box on the top right of Office documents with the words “Tell me what you want to do” in it. Type in a task you want to do, and you get a list of potential matches. Click any item in the list and you bring up instructions on how to accomplish it. For example, I typed in “Envelope” while in Word and got the options “Create Envelopes” and “Start Mail Merge.” I clicked each of the options, and was walked through the process of doing each task. Simple, clean and useful. I found this new feature to be a big time-saver, and much better than hunting through the Ribbon to find a command. It remembers the features you’ve previously clicked on in the box, so when you click in it, you first see a list of previous tasks you’ve searched for. That way, tasks that you frequently perform are always within easy reach. Maybe even more useful is that tasks that you rarely perform are easily within reach as well, because now you don’t have to be an Office expert in order to accomplish the most arcane tasks. Just type in what you want to do and follow the instructions. The feature is available in Excel, Word and PowerPoint, but not the rest of Office. Outlook in particular could use it, given the wealth of features it has that aren’t always immediately apparent. Another new feature, Smart Lookup, makes it a bit easier to do research or fact-checking while you’re working on a document. Right-click a word or group of words in Word, PowerPoint or Excel, and from the menu that appears, select Smart Lookup. Office then does a Bing search on the word or phrase and displays the results in a pane on the right-hand side of the page. In searching, Smart Lookup uses the context around the words, not just the words themselves, and so is designed to give you more relevant results. For instance, in PowerPoint when I selected the word “carbon” in a slide about carbon bonds in organic compounds, it was smart enough to bring up results for carbon-carbon bonds and carbon-hydrogen bonds from Wikipedia. In a Word document about 3D printing, when I used Smart Lookup to look up the word “printer,” it brought up Wikipedia results about 3D printing. Smart Lookup shows Bing search results when you right-click on a word or phrase in an Office 2016 document. There have been a number of other minor changes as well. In a cosmetic one, the Ribbon across the top of the program windows and in the title bars now has solid color in it rather than white. Each Office application has its own distinct color: blue for Word, green for Excel and red for PowerPoint, with Outlook a lighter shade of blue than Word’s. In addition, the menu text for the Ribbon (File, Home, Insert and so on) is a mix of upper- and lowercase rather than all caps, and it’s smaller than previously. Overall, I found it slightly more restful on the eyes than the previous version of Office. Sway, the free presentation application for creating interactive presentations that Microsoft released in January, now ships with Office. It’s no different than the current version of Sway, and there’s no integration between the rest of Office and Sway, so it’s a bit of an outlier. Microsoft says that eventually it will be integrated with the rest of the suite, but doesn’t yet have any details about how that will work. 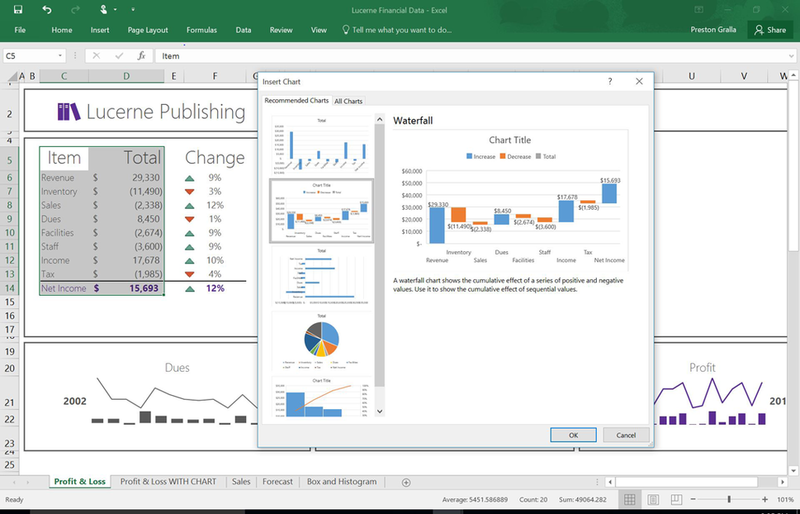 Spreadsheet jockeys will be pleased to see that Excel has six new charts, including a histogram (frequently used in statistics), one called “waterfall” that’s effective at showing running financial totals, and a hierarchical treemap designed to visualize revenue sources. Excel offers six new types of charts. I found a smaller addition quite useful as well. In what Microsoft calls the backstage area (it appears when you click “File” on the Ribbon), when you perform tasks such as opening a file, you see all of the cloud-based services you’ve connected to your account, such as SharePoint and OneDrive. That isn’t new – the feature was already in the 2013 version of Office. What is new, though, is that each of those locations now shows the associated email address underneath it — very helpful if you use a cloud service with more than one account. For example, I have two OneDrive accounts, one personal and one for business, and it lets me see at a glance which is which. In addition, if an enterprise IT department configures Office to enable it, the Windows 10 digital assistant Cortana integrates with Office, and can do things such as tell you what meetings and tasks you have that day. 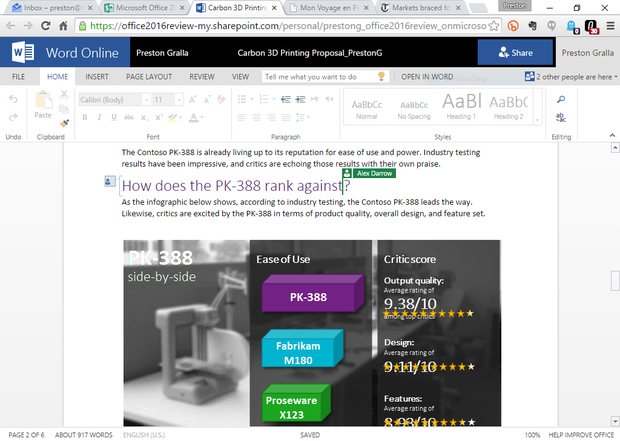 IT will be pleased with a number of under-the-hood improvements made in Office 2016. Perhaps the one that IT will welcome most is the extension of data loss protection (DLP) features to Word, PowerPoint and Excel. Until now, DLP has been available only in communications-oriented tools, including Exchange, SharePoint, Outlook and OneDrive for Business. 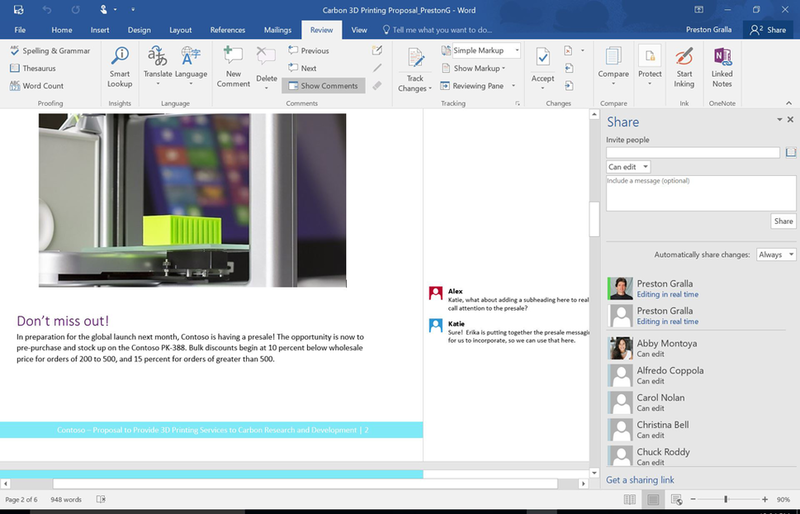 With Office 2016, DLP will allow IT administrators to create policies that govern document sharing and content authoring in Word, PowerPoint and Excel. So they’ll be able to control what kinds of information different users and different groups can include in the documents they create, and can also limit whom the documents are shared with and where they can be shared. Outlook gets a number of under-the-hood changes as well, including some that are designed to improve Outlook’s stability on unreliable networks and others designed to reduce the download time of email. Also included are improvements to Outlook search speed and reliability and an updated MAPI-HTTP protocol that Microsoft claims is more Internet-friendly. Users can now also reduce the amount of storage space Outlook uses by choosing to keep one, three, seven, 14 or 30 days of email on their devices. Other changes IT will welcome include improved traffic management with the introduction of a new service called Background Intelligence Transfer Service (BITS), which was designed to prevent network congestion during Office updates. There is also better integration with System Center Configuration Manager (SCCM) so administrators can more efficiently distribute monthly updates as well as control the number and pace of feature updates and bug fixes.